l to r: tens, hundreds, thousands; barista mag, kindness and mischief, humm coffee roasters. The desert coffee brand Cartel Coffee Lab adds another arid location outside of its Arizona roster in Palm Springs. Happy No. 7. Proving that a flavor wheel can more than describe and diagnose the body and flavor of coffee, there’s this by ‘Tarantula Teen’ for all the rainy, polar vortex winter feels. Thank God It’s First Friday Series is on again at Brooklyn based Parlor Coffee. With monthly tastings at 10 am on first Friday’s respectively it’s free coffee and free coffee education. Mark your March calendar. Maybe you want to go to your local coffee shop for coffee versus wine. If so, Bon Appetit says that such an adventure should happen at Methodical Coffee. It’s a collectible. 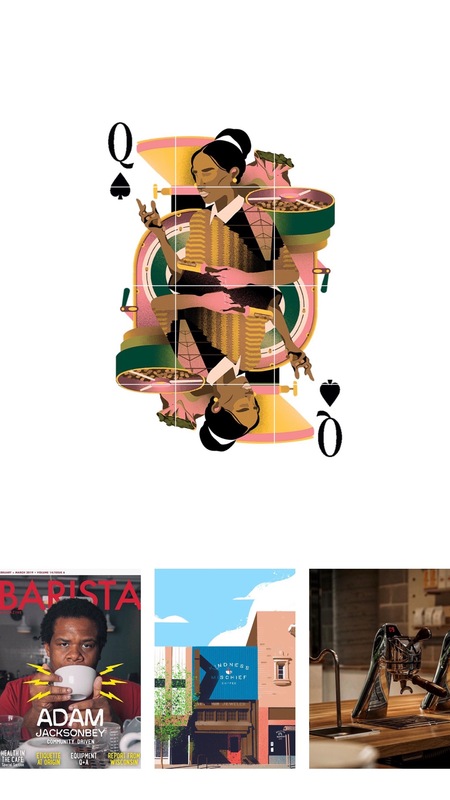 The funny, affable and passionate coffee community human that is Adam JacksonBey makes the February/March cover of Barista magazine, coupled with a few lightning bolts like a Wakanda superhero. You won’t be able to resit the artwork. The culture of coffee gets another hashtag and brand to inspire it to put its dollars behind well designed and illustrated goods: tens, hundreds, thousands. Country Music Hall of Famer Willie Nelson, launches Willie’s Remedy, organically grow hemp infused coffee where each 8 oz cup contains 7 mg of hemp derived CDB at $36. To install this coffee machine you’ll need a plumber, a carpenter and a flight to Australia’s Humm Coffee Roasters. This entry was posted in current culture and tagged adam jacksonbey, australia, barista, barista magazine, black history month, cartel coffee lab, cbd, hemp, highland park, hmm coffee roasters, kindness and mischeif, methodical coffee, palm springs, parlor coffee., polar vortex, tens hundreds thousands, willie nelson, willies remedy. Bookmark the permalink.